李斌, 张跃恒, 崔春兰, 罗群, 胡博文, 张磊. 湖南省保靖地区龙马溪组页岩气地质特征与成藏模式研究[J].中国地质调查, 2019,6(1): 17-25. LI Bin, ZHANG Yueheng, CUI Chunlan, LUO Qun, HU Bowen, ZHANG Lei. Shale gas geological characteristics and accumulation model of Longmaxi Formation in Baojing area of Hunan Province[J].Geological Survey of China, 2019,6(1): 17-25. Baojing area of Hunan Province is a new shale gas exploration block, and the geological characteristics and accumulation rule of shale gas are still worthy to be studied. The geological characteristics of Longmaxi Formation shale gas in the study area were summarized in sedimentology, porosity and permeability of the reservoir, geochemistry, gas content and other reservoir characters. 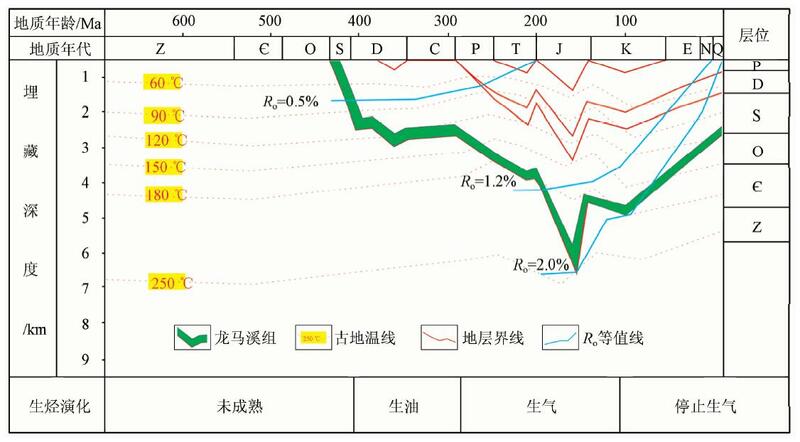 According to the study of hydrocarbon generation history, fracture characteristics, detachment layer movement, and fault effect, shale gas accumulation mode was explored. The results show that Longmaxi Formation shale gas in Baojing area of Hunan Province has high organic matter abundance, moderate thermal maturity, high brittle mineral content, and good physical properties, which means this reservoir has shale gas enrichment conditions. The shale experienced the stage of gas generation from Permian to Middle Jurassic. At the end of Middle Jurassic, trough-like folds in a fold-and-thrust belt were formed and the multiple reticular cracks and bedding decollement layer in vertical dimension were formed in Longmaxi Formation reservoir. 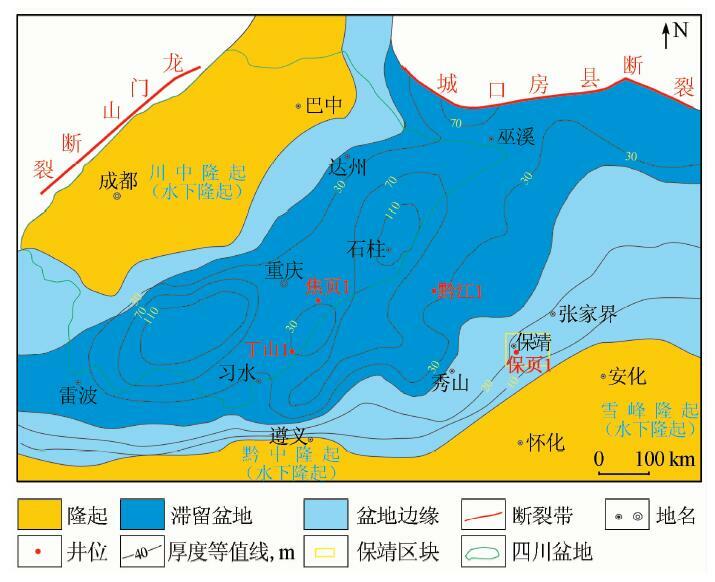 Therefore, the accumulation model of shale gas in Longmaxi Formation in Baojing area of Hunan Province can be briefly summarized as follows: migration in detachment layer, fracture accumulation, residual in pores, plugging by the fault, enrichment in higher areas and accumulation in box shape. 蒲泊伶, 蒋有录, 王毅, 等. 四川盆地下志留统龙马溪组页岩气成藏条件及有利地区分析[J]. 石油学报, 2010, 31(2): 225-230. 四川盆地下志留统龙马溪组发育富含有机质页岩.作为页岩气的源岩,该套页岩在盆地内分布广泛,厚度大,有机质含量高,有机质类型好,热演化程度高,生气潜力大;作为储层,页岩中孔隙和裂缝发育,为页岩气提供了充足的储集空间,并且等温吸附实验也表明,页岩具有较强的气体吸附能力;由于页岩的致密性及抗构造破坏性,本地区构造条件满足页岩气成藏要求.多口井下志留统页岩的气测显示也为页岩气的存在提供了有利证据.根据页岩厚度、有机碳含量、热演化程度和生烃强度等信息,预测宜宾-自贡-泸州一带及达州-万县一带为页岩气的有利勘探区域. Abstract： There develops shale with rich organic matters in Longmaxi Formation of the Lower Silurian in Sichuan Basin.This shale with a great thickness is the source of shale gas and widely distributed in the basin.As the source,the shale is characterized as high organic content,good organic type and high organic thermal evolution degree.As the reservoir,there exits great quantity of cracks,porous and wrinkles,which offers sufficient accumulated space for shale gas.The isothermal adsorption test shows that the shale has strong ability of gas adsorption.The structural condition in this basin is available for forming shale gas reservoir.The gas shows of many wells drilled in the shale strata of the Lower Silurian in this area indicated the great potential of shale gas.The shale indexes of thickness distribution, organic carbon content, thermal evolution degree and gas generation level in Sichuan Basin show that Yibin-Zigong-Luzhou and Dazhou-Wanxian areas are the favorable zones for shale gas exploration. 李斌. 湖南保靖地区龙马溪组页岩气成藏条件分析[J]. 特种油气藏, 2016, 23(5): 12-16. 李斌, 罗群, 胡博文, 等. 湘西地区叠加型前陆盆地沉积环境演化模式研究[J]. 中国石油勘探, 2016, 21(6): 81-90. 李斌, 胡博文, 石小虎, 等. 湘西地区志留纪沉积体系及典型前陆盆地的形成模式研究[J]. 地学前缘, 2015, 22(6): 167-176. 邹才能, 董大忠, 王玉满. 中国页岩气特征、挑战及前景(一)[J]. 石油勘探与开发, 2015, 42(6): 689-701. The main factors controlling the enrichment and high yield of shale gas were analyzed based on the recent research progress of depositional model and reservoir characterization of organic-rich shale in China. The study determines the space-time comparison basis of graptolite sequence in the Upper Ordovician Wufeng Formation�CLower Silurian Longmaxi Formation and proposes the important depositional pattern of marine organic-rich shale: stable ocean basin with low subsidence rate, high sea level, semi-enclosed water body, and low sedimentation rate. Deposited in the stage of Late Ordovician-Early Silurian, the superior shale with thickness of 20?80 m and total organic carbon (TOC) content of 2.0%?8.4% was developed in large deep-water shelf environment which is favorable for black shale development. Based on the comparison among the Jiaoshiba, Changning and Weiyuan shale gas fields, it is believed that reservoirs of scale are mainly controlled by shale rich in biogenic silica and calcium, moderate thermal maturity, high matrix porosity, and abundant fracture. 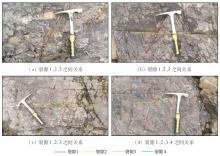 The shales in the Wufeng and Longmaxi formations are characterized by porosity of 3.0%?8.4%, permeability of 0.000 2×10?3?0.500 0×10?3 μm2, stable areal distribution of matrix pore volume and their constituents, great variation in fracture and pore characteristics among different tectonic regions as well as different well fields and different intervals in the same tectonic. 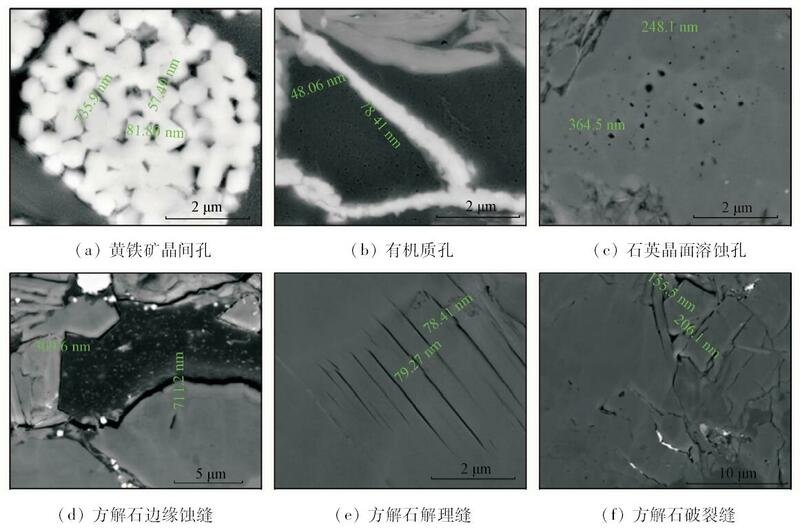 The Cambrian Qiongzhusi shale features poor physical properties with the porosity of 1.5%?2.9% and the permeability of 0.001×10?3?0.010×10?3 μm2, resulted from the carbonization of organic matter, high crystallinity of clay minerals and later filling in bioclastic intragranular pores. Four factors controlling the accumulation and high production of shale gas were confirmed: depositional environment, thermal evolution, pore and fracture development, and tectonic preservation condition; two special features were found: high thermal maturity (Ro of 2.0%?3.5%) and overpressure of reservoir (pressure coefficient of 1.3?2.1); and two enrichment modes were summarized: “structural sweet spots” and “continuous sweet area”. 张晓明, 石万忠, 徐清海, 等. 四川盆地焦石坝地区页岩气储层特征及控制因素[J]. 石油学报, 2015, 36(8): 926-939, 953. 于炳松. 页岩气储层孔隙分类与表征[J]. 地学前缘, 2013, 20(4): 211-220. 邱小松, 杨波, 胡明毅. 中扬子地区五峰组—龙马溪组页岩气储层及含气性特征[J]. 天然气地球科学, 2013, 24(6): 1274-1283. 久凯, 丁文龙, 李玉喜, 等. 黔北地区构造特征与下寒武统页岩气储层裂缝研究[J]. 天然气地球科学, 2012, 23(4): 797-803. Fracture development is one of controlling factors for shale gas reservoir,while there is close correlation between fracture and structural characteristics.Based on structural characteristics in the northern Guizhou area,we discuss the fracture features and distribution of lower Cambrian black shale.In the northern Guizhou area,the folds are mainly trough-like,and the faults are formed under cut and joint of fault system in different directions.The main times of fault system with different trending direction are different.Structural fractures are the main fracture types of the black shale and the horizontal fractures and low-angle fractures are dominant.The fracture-developed area is controlled by faults,especially NE- and NNE-striking faults.The fracture-developed areas are mainly lactated in end of the faults,inflection point,junction of different strike faults,and place between faults with similar striking orientation.Meanwhile,the steep part of anticline is also profitable to the fracture formation. 李忠雄, 陆永潮, 王剑, 等. 中扬子地区晚震旦世—早寒武世沉积特征及岩相古地理[J]. 古地理学报, 2004, 6(2): 151-162. 刘树根, 罗志立. 从华南板块构造演化探讨中国南方油气藏分布的规律性[J]. 石油学报, 2001, 22(4): 24-30. 李聪, 陈世悦, 张鹏飞, 等. 湘西北地区震旦—三叠系储层特征及分布规律[J]. 西南石油大学学报: 自然科学版, 2009, 31(5): 61-67. 汪正江, 谢渊, 杨平, 等. 雪峰山西侧震旦纪—早古生代海相盆地演化与油气地质条件[J]. 地质通报, 2012, 31(11): 1795-1811. 王剑, 段太忠, 谢渊, 等. 扬子地块东南缘大地构造演化及其油气地质意义[J]. 地质通报, 2012, 31(11): 1739-1749. 陈波, 皮定成. 中上扬子地区志留系龙马溪组页岩气资源潜力评价[J]. 中国石油勘探, 2009, 14(3): 15-19. 倪新锋, 陈洪德, 韦东晓, 等. 中上扬子盆地叠加、改造类型及油气勘探前景[J]. 地质学报, 2009, 83(4): 468-477. 胡健民, 孟庆任, 白武明, 等. 南秦岭构造带中—晚古生代伸展构造作用[J]. 地质通报, 2002, 21(8/9): 471-477. 毛黎光, 肖安成, 魏国齐, 等. 扬子地块北缘晚古生代—早中生代裂谷系统的分布及成因分析[J]. 岩石学报, 2011, 27(3): 721-731. During he Late Permian Changhsingian Stage-Early Triassic Induan Stage, a series of NW-trending deep-water rift basins formed along the northwestern margin of Yangtze block, which are named as the Kaijiang-Liangping rift, the Chengkou-Exi rift and the Jinmen-Dangyang rift respectively from west to east. They are approximately parallel to each other, but perpendicular or sub-perpendicular to the strike of the South Qinling orogen to the north. Giant gas field has been discovered along the edges of the Kaijiang-Liangping rift, which draws broad attention to these rift basins from geologists and oil & gas explorers. In this paper, we study the distribution and for nation mechanism of these rift systems which have good prospect in oil & gas exploration, and indicate that they were collision rifts forming during the closure of the south Qinling Ocean by the initial contact between the Yangtze block and the South Qinling orogen. 万秋, 李双应. 中扬子地区中二叠统沉积及古地理特征[J]. 地质学报, 2011, 85(6): 993-1007. Middle Yangtze Area is epicontinental basin in middle Permian, according to stratigraphic, lithofacies and sedimentary facies analysis, the thickness of Middle Permian is Gradually thinning from south to north, lithofacies Showed a gradient relations from south to north by the shallow marine limestone to the bathyal and deep-sea siliceous limestone, siliceous rock changes, depth of sedimentary water is Gradually becomes deeper from south to north. microfacies analysis showed widely developed calcirudite in the study area is sedimentary transported instead of differential compaction causes. 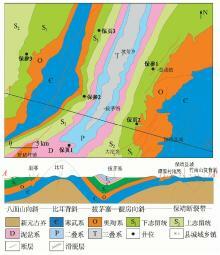 Qixia suffered extensive transgression in the middle Permian, in the northern margin of the middle Yangtze is the outer ramp �C deep water basin, in the main middle Yangtze craton is ramp deposition, some area is carbonate platform facies, western Hubei trough is outer ramp; Maokouan transgression is aggravated, the northern margin of the middle Yangtze is deep basin and the compensation is extended. Ramp remains in the main middle Yangtze area, western Hubei becomes to deep water basin. platform - ramp �C deep water basin from south to north build up a carbonate ramp depositional system in the study area, and is consistent with the regional tectonic framework. Syndepositional fault activity is a certain control element of the deposition in the study area, deposition of the northern margin of middle Yangtze basin is by the constraints of the South Qinling sea and under its control. 吴冲龙, 杜远生, 梅廉夫, 等. 中国南方印支—燕山期复合盆山体系与盆地原型改造[J]. 石油与天然气地质, 2006, 27(3): 305-315. 刘新民, 付宜兴, 郭战峰, 等. 中扬子区南华纪以来盆地演化与油气响应特征[J]. 石油实验地质, 2009, 31(2): 160-165. This artical analysed the basin evolution since Nanhua period in the Middle Yangtze region,and pointed out it undergo Caledonian,Hercynian-Early Yanshanian and Late Yanshanian-Himalayan three basin-mountain evolution cycle,rearched the response characteristics of hydrocarbon to basin evolution.The development characteristics and controlling factors of sourse rocks and reservoir rocks,and the control of paleouplift to hydrocarbon were analysed.Before Early Indosinian period,hydrocarbon migration were controlled by paleouplift.Parallel migration were main manner,and hydrocarbon were accumulated.In Late Indosinian-Early Himalayan period,the hydrocarbon were mainly destroied and regulated.The short range vertical migration were main manner.Hydrocarbon accumlation were finalizd in Late Himalayan period. 梅冥相. 中上扬子印支运动的地层学效应及晚三叠世沉积盆地格局[J]. 地学前缘, 2010, 17(4): 99-111. 刘少峰, 张国伟, 程顺有, 等. 东秦岭—大别山及邻区挠曲类盆地演化与碰撞造山过程[J]. 地质科学, 1999, 34(3): 336-346. East Qinling-Dabie Shan is a composite orogenic belt developed by subduction and collision of three plates along two suture belts,which underwent a nearly E-W trending,unsymmetrical,double-directed,multi-leveled tectonic superposition.Several kinds of flexural basins were formed by the collision among continental blocks during the plate tectonic period from Devonian to Triassic.The space-time evolution of the basins fully indicates the processes of the subduction of Shang-Dan oceanic basin,the arc-continent collision in North Qinling,and the oblique collision from the east to the west in Mian-Lue oceanic basin. 陈留勤, 段凯波, 霍荣, 等. 晚三叠世中扬子北缘前陆盆地层序地层特征及沉积演化[J]. 高校地质学报, 2009, 15(3): 328-338. 应用沉积学和层序地层学的基本原理和方法,对中扬子北缘上三叠统4条实测露头剖面和1条测井剖面进行了详细的沉积相分析和层序地层划分,同时阐述了沉积相迁移规律、层序界面类型、层序发育特征及其控制因素.研究结果表明,该地区上三叠统可以划分为4个三级层序(TSl,TS2,TS3和TS4),进一步归为1个二级构造层序.荆门一当阳盆地上三叠统沉积厚度约为1 200 m,4个层序发育完整;向东至汉川、鄂州一带地层变薄不足40 m,向西越过黄陵背斜至秭归、利川一带层厚100～300 m,后两者保存残留不全的上三叠统只能归为1个三级层序.层序界面类型主要有不整合面、河流冲刷侵蚀作用面和岩性岩相转换面等.在露头剖面和测井剖面层序地层划分的基础上建立的层序地层格架表明,中扬子北缘晚三叠世从TS1-TS2到TS3-TS4沉积组构发生了由低能到高能的转变.在构造、古地理背景和气候因素共同控制层序发育样式的背景下,研究区经历了从湖沼体系到冲积体系的转变,体现了晚三叠世中扬子北缘前陆盆地发育早期的沉积特征. 肖安成, 魏国齐, 沈中延, 等. 扬子地块与南秦岭造山带的盆山系统与构造耦合[J]. 岩石学报, 2011, 27(3): 601-611. In this paper, we studied the prototype of the Late Paleozoic-Early Mesozoic sedimentary basins in the northwestern margin of the Yangtze block systematically. Together with the synthetical analysis on the formation of the South Qinling orogen and the Mianlue suture, we discuss the collision history and basin-range coupling between the Yangtze block and the South Qinling orogen. 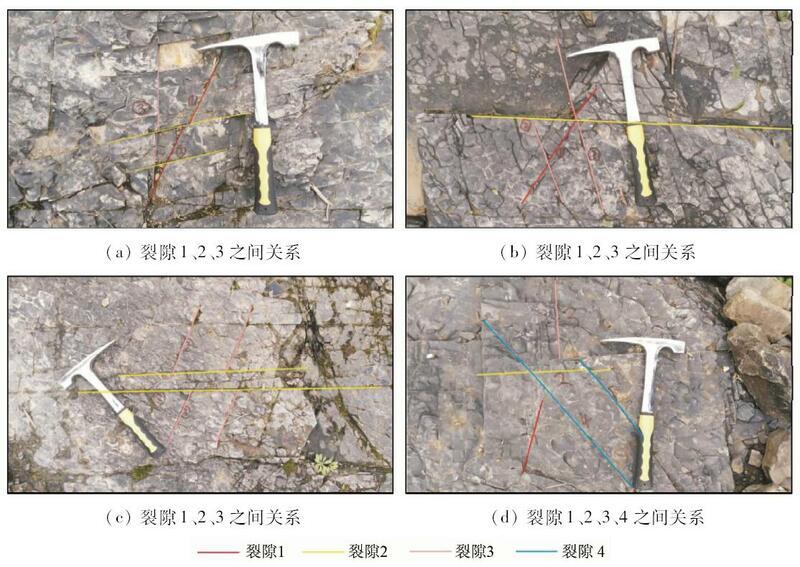 Our result indicates that the initial contact between the two tectonic units occurred as early as the late period of Late Permian (tipper member of Changxing Formation) and the early period of Early Triassic (lower member of the Feixianguan Formation). Several collision-related rift basins, including the Kaijiang-Liangping rift, the Chengkou-Exi rift and the Dangyang rift formed between the two tectonic units at that time from west to east. They lasted for ca. 5 similar to 6Ma and were characterized by the deposition of marine molasse sediments. During the period when the second member of the Jialingjiang Formation (Early Triassic) was deposited, the paleo-thrust belts related to the peripheral foreland basin formed near the Daba Shan and the Micang Shan due to the sustaining collision of the two blocks, which led to the formation of angular unconformity and the deposition of fluvial sediments near the suture. While far away from the suture, marine carbonate deposition remained dominating. During the Late Triassic, the South Qinling orogen and the Yangtze block collided completely and the ocean between them disappeared. Marine deposition ceased since then, and the foreland basin which was characterized by terrestrial molasse sediments started to develop in the front of the Daba Shan and the Micang Shan, the Shengnongjia-Huangling uplift and the Micang Shan uplift formed in the northern margin of the Yangtze block as well at the time. The Daba Shan and the Micang Shan areas were complicatedly altered by multi-stage contractional tectonic events since the Late Triassic, including the weak tectonic activity during the Late Jurassic and the early stage of the Early Cretaceous (J(3)-K-1) marked by regional disconformities and low-angular unconformities, the late stage of the Early Cretaceous characterized by the thin-skinned thrusting, and the strong deformation during the Late Cenozoic that was dominated by arc thrusting in front of the Daba Shan and basement-involved thrusting in front of the Micang Shan. 李建青, 蒲仁海, 田媛媛. 下扬子区印支期后构造演化与有利勘探区预测[J]. 现代地质, 2012, 26(2): 326-332. By recovery of erosion thickness of the latest Cretaceous and the latest Paleogene and the analysis of the maximum depth of Indosinian unconformity Tg0, it is suggested that the PaleozoicMesozoic hydrocarbon source rock have occurred late hydrocarbon generation and accumulation. In the latest Cretaceous, the largest erosion thicknesses of Huangqiao, Jurong and Wuwei areas are 1,000 m, 1,500 m and 800 m. In the latest Paleogene, the largest erosion thickness of Huangqiao area is about 450 m, but Jurong and Wuwei areas are not denuded. Under the paleogeothermal gradient of 3.3 ℃/100 m to 4 ℃/100 m, in the latest Cretaceous, the depths of about 70% PermianLower Triassic hydrocarbon source rocks are 2,000 m to 4,000 m and have entered the oil generation stage under the gas generation stage in Wuwei area; Almost all the PermianLower Triassic hydrocarbon source rocks have entered the oil generation stage in Jurong area,and its subsag region with depth below 4,000 m entering the gas generation stage; In Huangqiao area, about 70% PermianLower Triassic source rocks reach the oil generation stage, mainly in northern deep depression and western subdepression, and its deep parts have entered the gas generation stage. Many ancient nose uplift axises in Indosinian unconformity Tg0 since the latest Cretaceous hydrocarbon generation indicate the hydrocarbon migration paths, directions and accumulation areas, and their changes from Himalayan to the present indicate favorable prospecting areas. 王清晨, 蔡立国. 中国南方显生宙大地构造演化简史[J]. 地质学报, 2007, 81(8): 1025-1040. South China is characterized by extensively developed orogenic belts that enclose the Yangtze Craton(YzC).These orogenic belts were built up in various periods.They are the Triassic Qinling-Dabie Orogenic Belt(QDOB) in the north,the Mesozoic-Cenozoic Three-river Orogenic Belt(TOB) in the west,the Youjiang Orogenic Belt(YOB) in the southwest,the Middle Paleozoic Huanan Orogenic Belt(HOB) in the southeast,and the Mesozoic-Cenozoic Maritime Orogenic Belt(MOB) along the coast.A few micro continental blocks,such as Wuyi Block,Baoshan Block and South China Sea Block,scatter in orogenic belts.This paper described Phanerozic paleogeographic evolution of South China with the YzC as center,and their constraint to the accumulation of marine source rocks.Important tectonic events that have caused paleogeographic changes in South China include continental rifting that developed into passive margin in the period of Neoproterozoic to the Early Paleozoic,orogeny of HOB in the Middle Paleozoic,extension in the Late Paleozoic,closing of Paleo-Tethys in Mesozoic,subduction of Pacific Plate beneath Eurasia Plate since Jurassic,as well as collision between India and Eurasia Plates in Cenozoic.All these tectonic events have their own limitation in active time and influence region.Their influence and constraint to petroleum migration,accumulation and later adjustment are also limited.Therefore,it will be helpful in petroleum exploration to be practical and realistic in studying individual case. 汪泽成, 赵文智, 彭红雨. 四川盆地复合含油气系统特征[J]. 石油勘探与开发, 2002, 29(2): 26-28. Analysis of petroleum system in the composite petroliferous basin must be integrated with analyses on the basin evolution, multi-cycle tectonic-sedimentation the basin underwent and basin type, heat mechanism of hydrocarbon forming, and geological elements of petroleum system, clearly indicating the distribution and evolution of each petroleum system in the basin. The characteristics of mutli-source petroleum system mainly include several source kitchens piled up completely or partly and shared the common migration paths and same cap rocks. Some critical moments were in the same period, some of them were not. Paleo-uplifts are favorable area for hydrocarbon early accumulation in multi-source petroleum system. 郑和荣, 高波, 彭勇民, 等. 中上扬子地区下志留统沉积演化与页岩气勘探方向[J]. 古地理学报, 2013, 15(5): 645-656.